An excellent balance between concentrated green melon and gooseberries flavors with a smooth palate of lingering notes. With a brilliantly clear color the 2016 Sauvignon blanc express flavors of concentrated green melon and gooseberries with nuances of asparagus spears and green pepper. There is an excellent balance between the these flavors and the crisp acidity creates a smooth palate of lingering notes. Patience will be rewarded as these flavors opens up in the glass and delicious tropical notes trickles through. Named after the majestic views of the Simonsberg Mountain, Simonsig Estate is situated in the famous Stellenbosch Winelands just 45 km east of Cape Town. 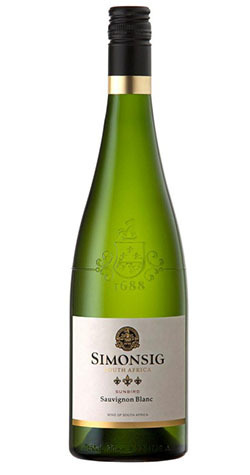 Simonsig Wine Estate comprises 302 hectares with 210 hectares (518 acres) under vines. The ancient soil types consist of sandstone, decomposed granite, and shale. All the vineyards receive supplementary irrigation.